Movistar, Team Sky, Trek Factory Racing and Tinkoff-Saxo are among the WorldTour teams that have not appeared on the list of invited teams taking part in the 2016 Tour of Oman (February 16-21), reducing the number of top-level teams to nine. The official list of teams taking part in the UCI 2.HC-ranked Middle East stage race was released by organiser ASO on Wednesday, with the number of WorldTour squads down from 13 in 2015 to nine. It follows a similar drop in WorldTour participation in fellow Middle East race, the Tour of Qatar. Ag2r, Astana, BMC, Dimension Data, Lampre-Merida, Etixx-QuickStep, Giant-Alpecin, Katusha and LottoNL-Jumbo are the included WorldTour squads. 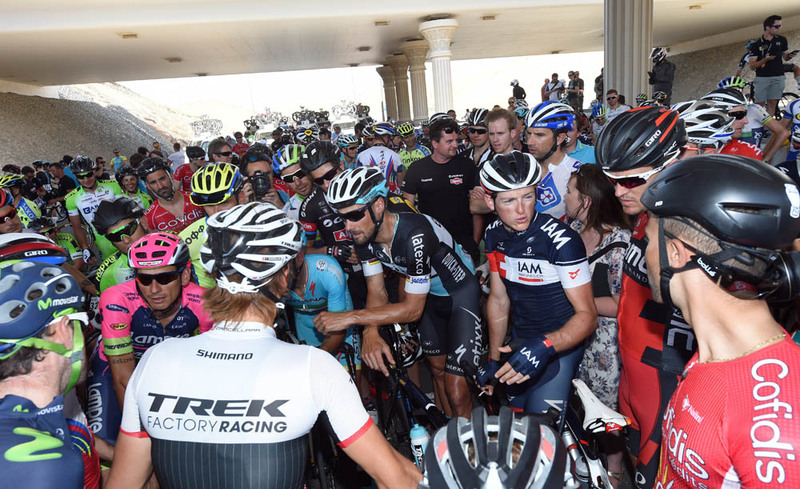 The reason for the reduction in WorldTour teams taking part in the Tour of Oman is not clear. It is possible that last year’s adverse weather and subsequent riders’ strike, which led to the cancellation of stage six, could have played a part. Temperatures reached the mid-40s and a sandstorm lashed the peloton, leading to a halt of the racing. The incident was one of the contributing factors in the UCI drawing up its Extreme Weather Protocol. Rafael Valls won the 2015 edition of the race for Lampre-Merida, but a switch of team to Lotto-Soudal over the winter means that the Spaniard will not be back to defend his title.